The great thing about going to Skeletor Karaoke Gong Show at the Trocadero is that it’s practically next door to Banana Leaf. And y’all know how much I love me some damn Banana Leaf. So along with the regular menu, they also serve sushi. But I’ve never been compelled to get it. I figure if I want sushi, I would go to a sushi restaurant. Why eat sushi at a malaysian restaurant? Apparently, H/A doesn’t have these thoughts, and he gets sushi here all the time. He got a roll (forget the name), which was actually quite expensive, but quite tasty. I believe it had white tuna involved. I really liked this and would totally order it again, if I ever find out what this is called. He also ordered the chili chicken, indian style. It was hilarious watching him try to eat this, as it was so damn spicy, that it was very hard for him to actually eat it, and he got totally sweaty in the face in the process. Eventually, he had to give up. If it isn’t fun to eat, then it’s just too damn spicy. 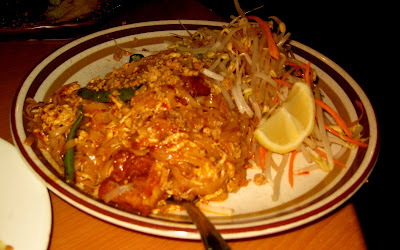 E likes pad thai so she went with that. 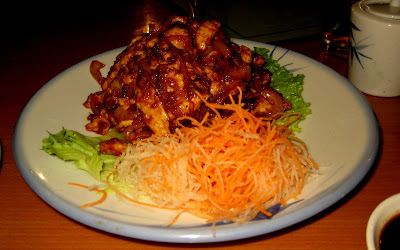 She also got the tofu satay, which I love. But I do have to say that on that night, the tofu satay looked awful. Hence, no photo. T showed up a bit late, and ordered the fried squid. 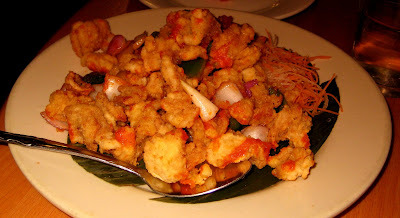 Fried squid is more of an appetizer in my eyes, but but it seemed to make a good entree as well. I tend to get a noodle dish here, so I did this time too. 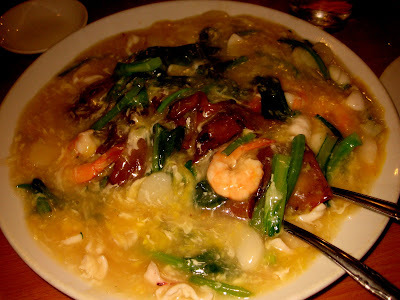 I got a chow fun with seafood and egg. The gravy itself was fairly bland so I got some chili oil and once I put a little of that on everything, it was great.